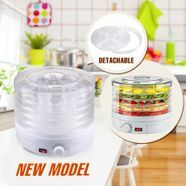 Thanks to the Round Adjustable Food Dehydrator with Removable Trays, you can now easily preserve assorted fruits, meats, and vegetables. Live a healthy lifestyle by making your own tasty and nourishing dried fruit snacks! Personalize your favorite recipes and create food that is conveniently dried and stored- perfect for improvised meals! Dehydrating food becomes an easy task if you use this food dehydrator. This wonderful product is user-friendly- it was designed to easily retain the freshness and mouth-watering flavour of different types of nutritious food. Even newbies to food processors can use this product- just ready the food and put them on the trays. The heat that travels through the food dehydrator will dehydrate the food while keeping in the flavour. The unit comes with 5 trays that both rotate and can be removed for easy use. While eating fresh food is beneficial, dried food has the added benefit of an extended shelf life and convenient storage. Frequent campers and avid backpackers can also take advantage of dried foods since its lighter weight is more convenient.